We over at FieldComm Group just heard the announcement. Two of our very active member companies have joined forces. MACTek and Pepperl+Fuchs are now together to strengthen their WirelessHART offering! Congratulations on all sides! Austin, Texas, August 13, 2015 — The FieldComm Group today announced release of the first update to its newest tool deliverables, the FDI Package IDE and the FDI Common Host Components. Version 1.1 of the development tools introduce exciting new capabilities for FDI product developers including an automated device package test tool, support for PROFINET based device packages, and support for developing device packages capable of offline configuration, including upload and download features. Since the dissolution of the FDI Cooperation July 28, 2015, both PROFIBUS and PROFINET International and FieldComm Group, as co-owners of the tools and components, have partnered together to support, maintain and enhance FDI products. Development of a single software product across all protocols will be performed at FieldComm Group in collaboration with PROFIBUS and PROFINET International through the Group’s working group model. FDI tools and host components are currently available for purchase from FieldComm Group across FOUNDATION Fieldbus, HART and PROFIBUS/PROFINET protocols. FDI makes it easier for automation suppliers to develop and integrate intelligent devices because suppliers only need to create a single, unified package for each intelligent device that can work with all host systems and tools. This reduces overall development costs, while preserving and expanding existing functionality. Users will also find it easier to manage information from intelligent devices with a single device package, instead of managing multiple file types for disparate solutions and investing significant capital in custom integration efforts to connect multiple technology platforms. The FDI Device Package IDE is a tool for device developers to create FDI Packages and includes everything a host system needs to integrate the intelligent device into their system. With FDI, a single FDI Device Package makes it easier for device suppliers to develop and integrate their device across a wide range of host systems and protocols. The FDI Common Host Components are software components for host system manufacturers that allows for rapid development and support of FDI device packages into their host systems. The components help system suppliers ensure they properly comply with the standard and consume device packages correctly. The FDI Common Host Components fully support both the new unified EDD file format as well as legacy EDD formats to protect end user investments. As many of our readers may recall, we wrote a blog post back in September of this year detailing the massive user demand driving unprecedented numbers of product registrations. We were on track for a record year, and we’re here to tell you today…the record has been broken. 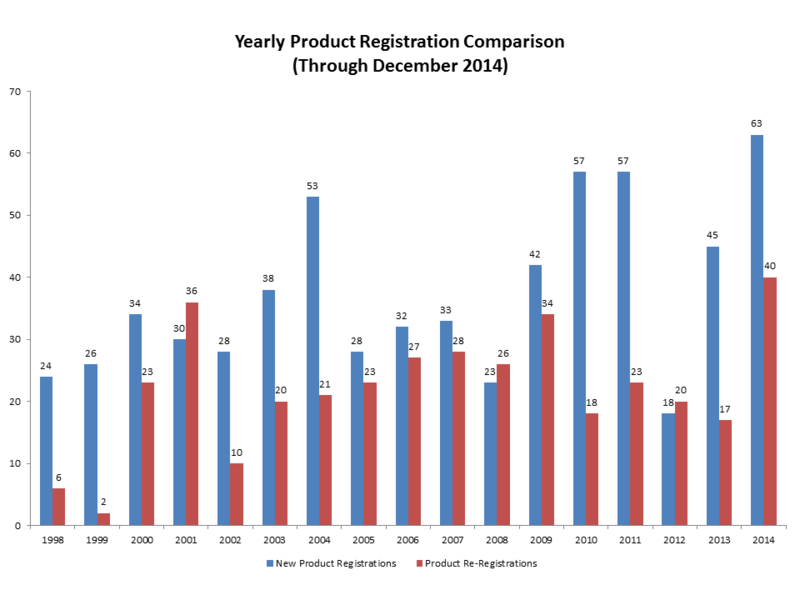 2014 has seen three major product registration achievements surpassed in the month of December, and one of them has been standing for 13 years! Rather than drag on about how fantastic FOUNDATION technology is and how these record numbers prove its digital dominance, let’s jump into the “meat” of the story and reveal the three achievements. We would classify two of them as major achievements, and the third as a major milestone. Achievement #1 – Largest Number of New Product Registrations Ever! Eclipsing the previously held record is no small feat, but nonetheless it was eclipsed. 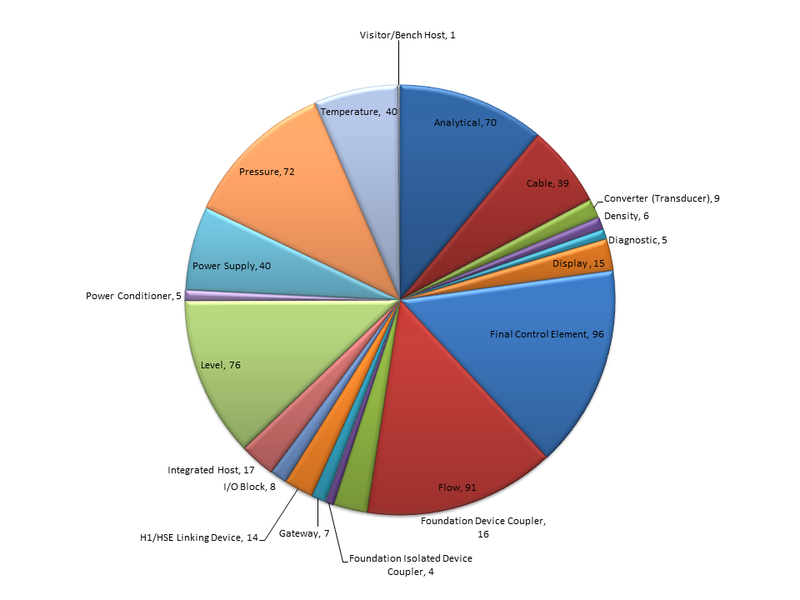 In 2014, the Fieldbus Foundation registered 63 new product registrations. The most in the 20 year history of the Fieldbus Foundation. This is an achievement the Fieldbus Foundation, its members and the process automation industries at large should be proud of. After years of dedication and advancement of arguably the most robust digital technology on the market, it still continues to grow and expand to meet and exceed the needs of process industry users. Without the strong member support, and the worldwide acceptance and adoption from the end user community, FOUNDATION technology would not be able to reach goals like this. This particular achievement owes much of its success to the continued expansion of our membership and to the continued development of exciting new FOUNDATION capable devices. When new members and more FOUNDATION capable solutions are combined, the results can be impressive. Achievement #2 – Largest Number of Product Re-Registered Ever! This achievement is another shining example of the worldwide acceptance of FOUNDATION Fieldbus and its continued use in the process automation industry. In 2014, the Fieldbus Foundation re-registered 40 products. As the needs of users across the world evolves and changes, so too has FOUNDATION Fieldbus and that fact is represented in the product re-registration numbers. Just like the 2014 new registration numbers, the re-registrations are the highest in the Fieldbus Foundation’s 20 year history. Product re-registrations represent a plethora of enhancements from re-visioning through ITK testing to functional enhancements to usability improvements designed to make the user experience much simpler and more intuitive. Overall, 2014 was the most successful total product registration year that the Fieldbus Foundation has ever had and a big thanks goes to all of our supporters across the globe. Reaching a major milestone in the Fieldbus Foundation’s history, it recently registered the 1,000th FOUNDATION Fieldbus product. What a truly impressive milestone to pass for the organization and its all thanks to our robust industry leading Registration Program. The thorough interoperability testing that the Fieldbus Foundation puts each and every device through is the corner stone to the success FOUNDATION Fieldbus has had in the industry. It has helped ensure proper communication and robust network interaction across the whole process automation infrastructure. In true form to the Fieldbus Foundation’s mission to provide an automation infrastructure for open, scalable integration of disparate instruments and technologies, the 1,000th device registration happened to be from one of our longest standing members, Softing AG. Even more telling, the device is one that exactly sums up what FOUNDATION Fieldbus has always been about; Integration. Softing’s device, as if from some insight from “the beyond”, is dubbed FFEasy HART and is a hardware device that can be easily integrated into existing HART devices in order to turn them into FOUNDATION compatible devices. Simply put, the purpose of Softing’s FFeasy solution is to significantly reduce the implementation effort to enable a non-native (by original design) fieldbus device to communicate via FOUNDATION Fieldbus. Big thanks to Softing on helping the Fieldbus Foundation achieve such a great milestone. The Fieldbus Foundation’s surprise 20th birthday present (or should I say presents?) is the perfect way to close out the final year of the Fieldbus Foundation as it transitions into the new FieldComm Group with its industry associate HART Communication Foundation at its side. The Fieldbus Foundation UK Marketing Committee (FFUKMC) will be a leading participant of the forthcoming Hazardex In The Regions conference and exhibition series 2014/2015 as an event sponsor, exhibitor and conference speaker. The second conference and exhibition will take place on Wednesday November 26th 2014 at the Dept. of Business, Innovation & Skills (BIS) Conference Centre, 1 Victoria Street, London SW1 0ET. The Hazardex In The Regions conference and exhibition events are targeted at hazardous operations personnel in the process industries and will take place in locations convenient for the oil & gas, pharmaceutical, chemical, utilities, new energy and food & beverage industries. The FFUKMC will present a paper that addresses “The application of FOUNDATION™ fieldbus and the intelligent field towards improving safety in hazardous area process plant”. FOUNDATION fieldbus technology was designed for use within the process industry and the hardware specification has always had hazardous area implementation in mind. The presentation will describe how the application of the technology works to reduce risk to workers and also increases productivity. The FOUNDATION fieldbus design and its application can steamline work procedures and increase the data available to make informed business decisions based on asset status and device degradation information. The conference speaker programme will also include presentations from senior UK HSE and UKPIA staff. Full details of the conference programme can be found on the Hazardex In The Regions – London webpages. A table top exhibition in an adjoining area will offer all conference delegates and exhibition visitors the opportunity to view and discuss participants’ products and services with company and organisation representatives. The Fieldbus Foundation display will include a live FOUNDATION technology demonstration for a practical, hands-on understanding of the technology, its application and usability with a focus on supporting a FOUNDATION installation through asset management; device replacement; calibration and recommended maintenance practices. In addition to the conference programme and exhibition, all pre-registered delegates will receive an information pack, refreshments and lunch. Guests of the Fieldbus Foundation UK Marketing Committee are eligible for a 10% discount on the delegate rates by quoting promotional code ‘Fieldbus Foundation’ on the booking form. Also – a special promotion of ‘two for one’ delegate places is available – visit the Hazardex webpages for more information on this offer. Visitors unable to attend the whole day conference are invited to pre-register for an exhibition-only permit that allows free of charge entry to the exhibition only. Please see attached booking form. The event will be held on Wednesday 26th November 2014 at the BIS Conference Centre, 1 Victoria Street, London SW1 0ET. The next Hazardex In The Regions UK events will take place in Swansea (28 January 2015) and Ellesmere Port (25 February 2015). The FFUKMC will be participating in all UK events. The FFUKMC was formally established in 1999 to promote an increased awareness and adoption of FOUNDATION™ technology throughout the United Kingdom and Ireland through a range of end user focused activities including technology seminars and roadshows, technical demonstrations and support, and trade show and conference participation. The Fieldbus Foundation UK Marketing Committee (FFUKMC) will be a leading participant of the forthcoming Hazardex In The Regions conference and exhibition series 2014/2015 as an event sponsor, exhibitor and conference speaker. The first conference and exhibition will take place on October 8th 2014 at the Airport Thistle Hotel, Aberdeen, Scotland. Richard Barnes, chairman FFUKMC, will present a paper that addresses “The application of FOUNDATION™ fieldbus and the intelligent field towards improving safety in hazardous area process plant”. FOUNDATION fieldbus technology was designed for use within the process industry and the hardware specification has always had hazardous area implementation in mind. Richard Barnes will describe how the application of the technology works to reduce risk to workers and also increases productivity. The FOUNDATION fieldbus design and its application can steamline work procedures and increase the data available to make informed business decisions based on asset status and device degradation information. Additionally, FOUNDATION technology itself received protocol type approval for use in safety applications from TUV. More information on FOUNDATION for Safety Instrumented Functions can be found HERE. The conference speaker programme will also include presentations from senior UK HSE and UKPIA staff. Full details of the conference programme can be found on the Hazardex In The Regions – Aberdeen webpages. In addition to the conference programme and exhibition, all pre-registered delegates will receive an information pack, refreshments and lunch. 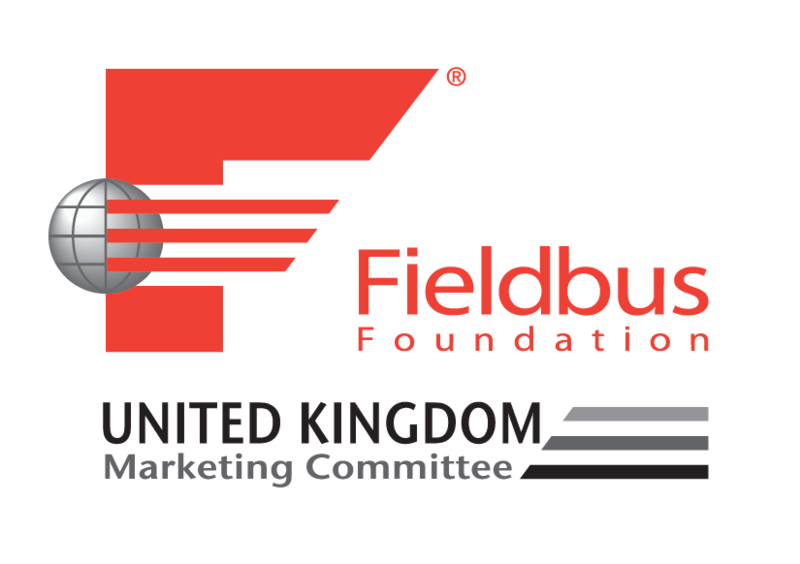 Guests of the Fieldbus Foundation UK Marketing Committee are eligible for a 10% discount on the delegate rates by quoting promotional code ‘Fieldbus Foundation’ on the booking form. A booking form is attached, or visit the Hazardex – Aberdeen webpages. The event will be held on Wednesday 8 October 2014 at the Airport Thistle Hotel, Argyll Road, Aberdeen, AB21 0AF. Tel: 0871 3769001/01224 793201. For directions, visit the Airport Thistle Aberdeen website. In addition to the Aberdeen event, the Hazardex In The Regions UK series will also hold events in Central London (26 November 2014), Swansea (28 January 2015) and Ellesmere Port (25 February 2015). The FFUKMC will be participating in all UK events. 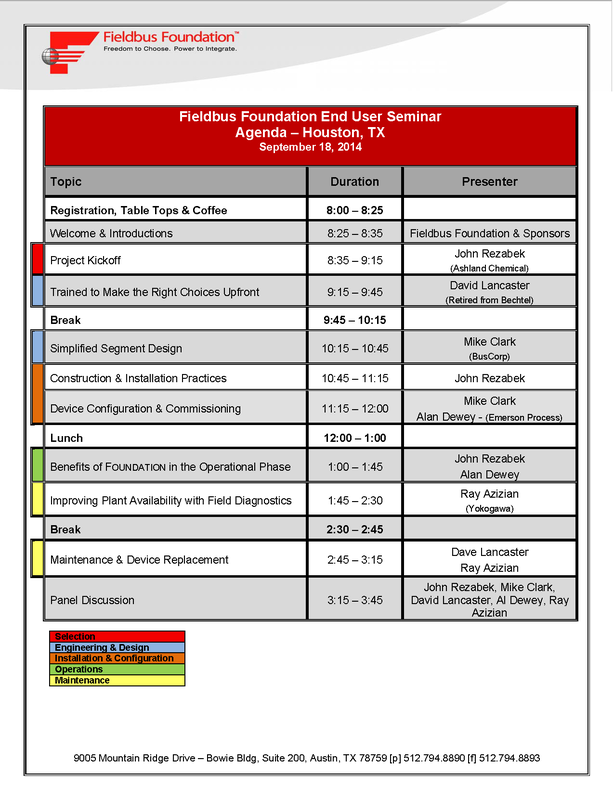 Last week, the Fieldbus Foundation completed the last two seminars of 2014, ending a year of successful events in North America. 2014 brought many new challenges as the marketing committee, alongside a small group of dedicated folks, committed to the full revamp of the seminar program. A major part of that revamp project was to create a new demonstration unit, except with some new constraints. Previously, our old demo units were massive steel “trees” with instruments hanging off them. While it made showcasing instruments easy, and the layout simple, they consumed a ton of space and were expensive and difficult to ship. Each case averaged about 3’x4′ in size and weighed roughly 300 lbs. We hoped to downsize dramatically to make a more compact demo that would fit within 3 or 4 medium sized Pelican cases. It’s is quite the task. Adding additional challenge to the downsizing, we wanted to create an actual working demo capable of running a live process. Letting uses see devices on a “tree” hooked up and communicating is great, but when you can show them the same instruments actually running a process and how they react during interruptions, that is just plain cool. As readers of this blog may have seen, Fieldbus Foundation actually put together a blog post on the new demo unit already. You can check it out HERE. Also revamped in the 2014 program were the presentations by the speakers. The idea was to base the entire day seminar on a full project lifecycle from inception to FEED and all the way through construction, operations and maintenance phases of a plant. The idea being to showcase FOUNDATION fieldbus along each step of a project. It proved to be a smashing success. By conclusion of the series last week, evaluations have shown the seminars were very highly acclaimed with attendees calling it “The best seminar yet” and “Awesome”. In fact, each agenda item throughout the day were better reviewed than 2013. The program was given an average of 4.4 out of 5.0 by attendees on the year. A big part of making our seminars interactive and worthwhile for the attendees is the lighthearted atmosphere where speakers allow discussion during presentation and reward conversation. 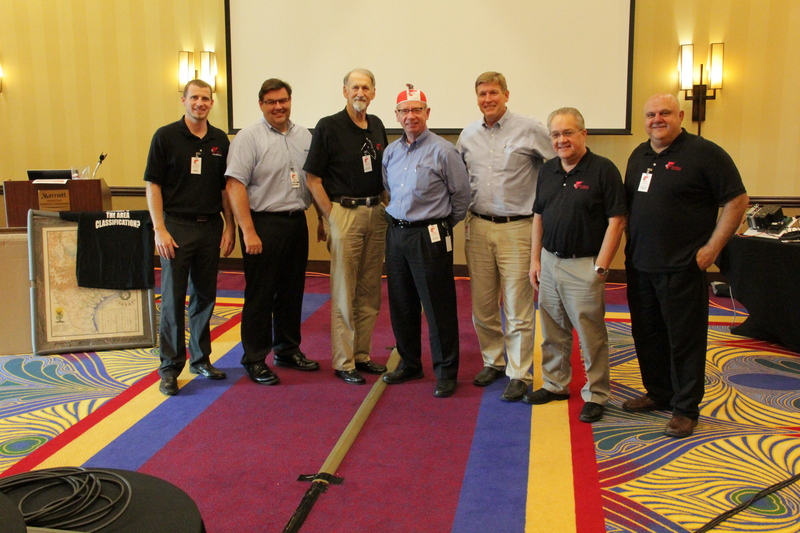 In the Baton Rouge & Houston seminars we passed out a fieldbus beaniecopter to the nerdiest (a.k.a. the best) question asked during the day. Below is a picture of the group awarding Mr. Hotaling for his great questions. If you missed out on the seminars in 2014, or there wasn’t one in your area be sure to keep an eye out in 2015 as we move forward on the seminar series. Dates & Locations are yet to be determined so if you’d like to see a seminar in your area be sure to contact the Fieldbus Foundation. You can keep up with our Events page or subscribe to our e-Newsletter for the latest information on seminar events in 2015. 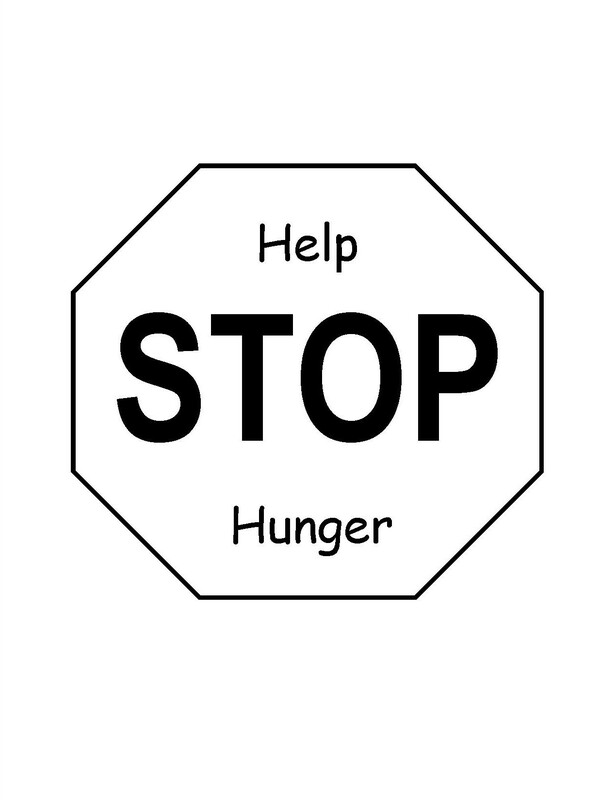 Do you Hunger for Open Standard solutions? John Rezabek, in the latest issue of Control Magazine presents a simple question “Do users hunger for open standards?” If not, why not? Are the benefits of open standards just not clear or are they simply pushed to the back of a list of priorities? If you as a user are not demanding open, interoperable solutions that suit both the needs of you today, and tomorrow, are you not doing yourself a major disservice? At the very least, you’re inviting complex, one-off solutions that may end up being unserviceable a few years down the road as companies get bought up or shut down, or their custom integration engineers retire or move on. John gives a great real world example from his plant on how scenarios play out 10 years down the road when these one-off highly customized solutions start having issues, and it’s a strong case for open standards. As John puts it, “…you just can’t be Apple to your customer and control every widget you sell”. There is one way users can help stop fieldbus hunger, and that is with their wallets. By demanding open standards, users ensure plant longevity and future-proof their installations against proprietary, highly customized solutions that often come to an abrupt end when support discontinues.